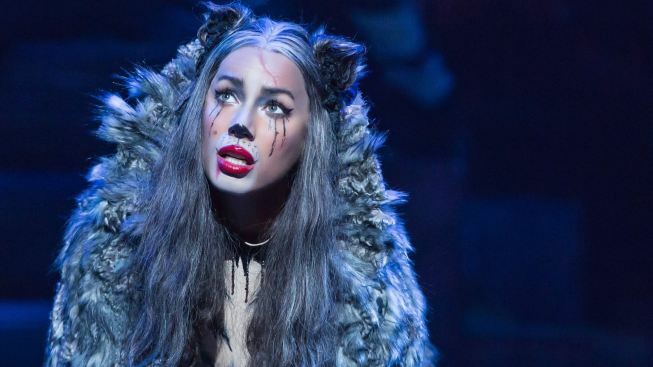 British singer-songwriter—and former "X Factor" winner—Leona Lewis is an understated Grizabella in Broadway's revival of "Cats." Below, the company. “Cats.” The “Hamilton” of its day? I imagine I’m not the only one who will lap up the “Cats” revival, now at the Neil Simon Theatre, in part thanks to that musical touchstone. A nostalgia trip with updated choreography—by the man behind the moves in “Hamilton”—this new “Cats” is peppy and kinetic, if sometimes a tad monotonous. Once a year, a tribe of cats gathers to learn who will rise to the Heaviside Layer—it’s a real thing—and return to a new life. Again directed by Trevor Nunn, the musical introduces us to two-dozen felines, all of whom get the chance to convey their personalities. In a way, they’re auditioning for Old Deuteronomy (Quentin Earl Darrington, wearing what looks like a ca.-1977 shag carpet). If this sounds like a prime showcase for any number of high-stakes talent contest winners, it is. The showiest singing role in “Cats” is Grizabella, “the glamour cat.” British singer Leona Lewis (the one-time “X Factor” winner whose hits include “Bleeding Love”) inherited the collar for this New York production after a contretemps between West End star Nicole Scherzinger and the composer. Scherzinger, incidentally, wasn’t the only one throwing water on these kittens: original choreographer Gillian Lynne said she was “very angry” that “Hamilton” Tony-winner Andy Blankenbuehler was brought in to update the dancing: “It makes me feel like I’d like to murder,” she said. Meow. Blankenbuehler’s work acutely enhances the personality of each cat, as with the acrobatics by Mungojerrie and Rumpelteazer (the winning Jess LeProtto and Shonica Gooden, who are nicely matched as mischief-makers). The “Cats” cast is perfectly up to their feline mimicry: I was particularly touched by Christopher Gurr’s palsied old Gus, the theater cat, as well as Ricky Ubeda (the season 11 winner of “So You Think You Can Dance”), who lights up Mistoffelees with requisite magic and mystery. If there’s a flaw to this approach, it’s that the cats’ stories don’t relate to each other or in any way drive the plot forward. Despite the variety of personalities, things start to feel repetitious. “Cats” is full of catchy pop tunes many of us have known for decades. Webber’s songs don’t have the tightest of melodies, but I’ll take “Cats” over “School of Rock” any day. As a wistful recollection, “Cats” is guaranteed to leave you feline groovy—it’s here now, though I wouldn’t bet on it lasting forever. “Cats,” at the Neil Simon Theatre, 250 W. 52nd St. Advance ticket sales through Jan. 15, 2017. Tickets: $59-$149. Call 877-250-2929.